Alexander Klimchuk has become the first photographer to die in the war in South Ossetia. He was 27. Klimchuk who was working for Itar-Tas, were killed on Sunday while trying to cover the arrival of Georgian forces. According to Reporters Sans Frontieres, he was killed when the vehicle he was travelling in was fired upon by Ossetian pro-independence fighters at a checkpoint. Reporter Giga Chikhladze was also killed, and two other journalists were wounded in the attack. 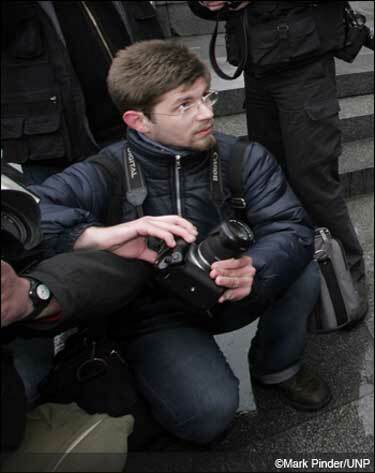 Klimchuk began his career as a reporter, but after completing a degree in journalism at the State University of Georgia in 2002, he became a staff photographer at Eye of Georgia , and freelancing for ITAR-TASS, Photoexpress, EPA and Polaris Images. His photographs have been published worldwide, including Newsweek, The New York Times, and Le Monde. He was head of the Tbilisi-based photo agency, Caucasus Images. Photographer and EPUK member Mark Pinder was a friend of Klimchuk, who he first met in May 2005, and Pinder recalls his “great hospitality” when he returned to the Caucasus seven months later. In return, Pinder arranged for unused camera equipment to be donated to Klimchuk and his colleagues, who were struggling to pay for equipment on the low wages in the region.